"I came here on an open day; I just thought it was amazing"
If you really want to know what St John's is like, the best people to ask are the students who come here! In the short films on this page, some of our recent and current students - both undergraduates and postgraduates - talk about why they chose the College, their subjects and their wider interests. There are more films like these on our YouTube channel. You can also meet many of our students at our regular open days and access events. Check out the "Open Days and Schools" page to find out more, or message our College Admissions team to book a visit. Mercedes McCambridge is from Glenelg, a remote and extremely beautiful part of Scotland. She is doing an undergraduate degree in Japanese and is one of the first students to receive one of the College’s new Studentships – an award that that reduces financial pressure on successful applicants to the College and ensures St John’s remains accessible to those from low-income backgrounds. In this short film Mercedes tell us about her home village, her course and how being awarded a Studentship made Cambridge possible. Lynn was born and raised in south London and grew up wanting to be a doctor. But the death of a close friend from leukaemia and the realisation that only science can drive medicine forward put her on the path of an academic career in biology in the hope of helping future patients. In this short film, Lynn tells us about her PhD research exploring ways to make tumours more visible on MRI scans in the labs at the Cancer Research UK Cambridge Institute. She explains the motivations for her work, why she chose to become a student of St John’s and where she hopes to take her career in the future. Varun Warrier grew up in southern India and is now a PhD student at St John's working on the genetics of autism. In this short film, he tells us about how the study of the relationship between genetics and personality traits is an increasingly important feature of autism research, and discusses some of his own recent work in this field. Gabriela Montejo-Kovacevich is from Madrid, Spain. She is in her first year studying for a PhD that looks at how Heliconius butterflies genetically adapt to different climates and environments – an area of research that is becoming increasingly relevant as our planet warms and scientists question how different organisms will respond and how rapidly they might be able to evolve. In this short film Gabby tells us about her PhD project and the frequent trips she makes to South America to study butterflies in their natural habitat. We also meet Gabby’s supervisor, College Fellow and Professor of Evolutionary Genetics, Chris Jiggins. Gabby and Chris tell us about the challenges and surprises of working in the rainforest environment and demonstrate how methods of butterfly capture haven’t changed much since the 19th century. Dominic Holloway grew up near Woking in Surrey, and started taking swimming seriously when he was at school. By the time he applied to university, he was so committed to the sport that he was unsure about whether Cambridge was the right choice for him. Since arriving, however, he has found that the University Swimming Club provides a range of unique opportunities to compete in an intense environment - not least in Varsity contests against arch-rivals Oxford. We also hear about Dominic's course, which he finds offers the right balance of theory and practical work, as well as opportunities for students to pursue their own research. Nora Kalinskij was born in Lithuania and grew up in Paris. She is in her third year studying Human Social and Political Sciences at St John’s College and focuses on the Politics and International Relations subject “track” of her course. 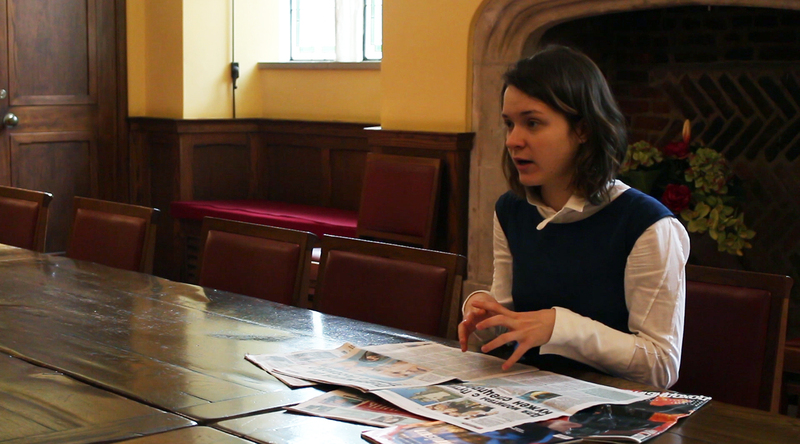 In this short film Nora tells us about her interest in Russian-European relations and how her language skills enable her to view current affairs from different cultural perspectives. She explains why as a prospective student she chose to apply to St John’s and how the College has helped her to pursue her interests in languages and Russian foreign policy with summer schools and courses. Nora also talks about the student society she started at St John’s – the Culture Hub – which aims to bring students from the diverse College community together to explore their different perspectives on world issues and events. Jen McGaley, who is 20, is from Suffolk and went to Bury St Edmunds County Upper School. She is in her second year studying Biological Natural Sciences at St John’s College and has two great passions in life: plant sciences and kayaking. In this short film Jen tells us about her sporting and academic activities and her experiences as an undergraduate at St John’s so far. She explains how the College has helped her to pursue her interests with kit grants, funding for sports societies and a bursary for a plant sciences summer school. Jen also talks about the accommodation on offer to students of St John’s, which the College guarantees for the duration of a degree. She explains how there is a range of choice on offer to suit different tastes and budgets and how much she loves having the River Cam right outside her room. Student Ruari Crichard combines his course in Modern and Medieval Languages at St John's with a passion for cricket. He has played for the College, the University of Cambridge, and the Cambridge MCC University side. In this short film, Ruari tells us how he got into cricket and how he balances his academic and sporting commitments. Rebecca Thomas, who is 24, is from Cardiff and went to a Welsh-language comprehensive school called Ysgol Gyfun Gymraeg Glantaf. She first came to St John’s College as an undergraduate, and is now studying for a PhD in Anglo-Saxon, Norse and Celtic, known as ASNC for short. In this short film she explains why she applied to the college, what her work here involves, and how some unexpected connections between St John’s and Wales have informed her research into Welsh identity during the 9th and 10th centuries. Rebecca also talks about the library resources available at St John’s, which include a 24-hour working library, and the magnificent 17th century Old Library, which houses the college’s special collections and rare books. She also explains how College and University funding support have together helped her to pursue these interests beyond her original history degree.